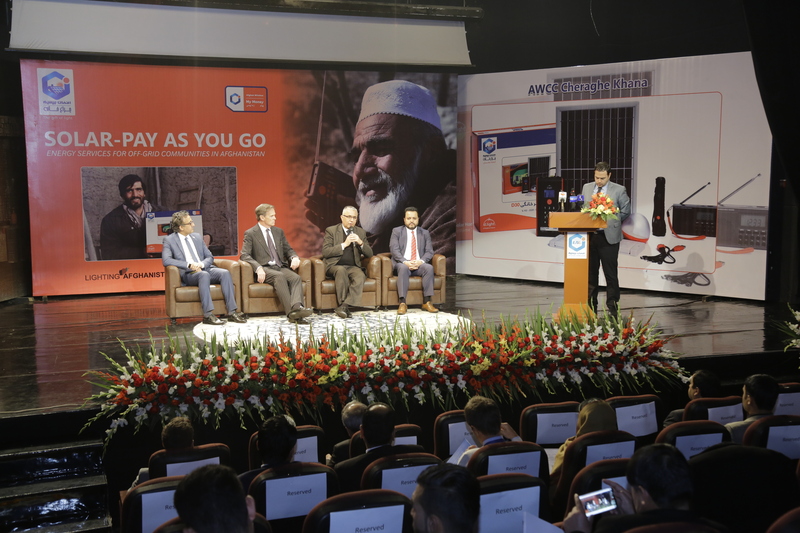 Lighting Afghanistan, an energy initiative of the International Finance Corporation (IFC), introduced the first Pay-As-You-Go (PAYGO) platform for solar home systems in Afghanistan in collaboration with The Afghan Wireless Communications Company (AWCC), GSMA, and d.Light. This off-grid energy platform promises to electrify rural off-grid households and communities in Afghanistan. In Afghanistan, nearly 60% of the population – over 20 million people — is not connected to the national electric grid. Despite efforts from the government and its development partners to expand the reach of the grid, the difficult terrain, dispersed rural communities, and precarious security conditions leave most rural households without reliable energy access. Solar Home Systems (SHS) represent a viable opportunity to provide basic energy services to those left unserved. This technology is now made affordable and available to rural households thanks to the PAYGO business model and d.Light’s solar home system, a Lighting Global Quality Verified product. PAYGO, a business model that allows users of SHS to pay for the energy service they receive through small monthly installments until the asset is paid in full, allows the operator to install the system and retrieve the payment over a long-time period (usually 12 or 18 months). If the user does not pay, the system will automatically switch off (lock) until the next payment is made. Once all installments have been paid, the SHS will be permanently unlocked by the operator and the user will own the system with free access to energy. Solar PAYGO has driven the sales of SHS worldwide, making high quality systems affordable to remote rural communities. Over 800,000 households globally were electrified by PAYGO solar companies in the first semester of 2018 alone. With the support of Lighting Afghanistan, AWCC, d.light and GSMA will pilot the program to AWCC’s My Money mobile money customers in the provinces of Nangarhar and Kandahar. After the initial pilot phase, these d.light PAYGO enabled systems will be offered to all AWCC clients and to the public through Afghanistan. AWCC is Afghanistan’s first wireless communications company and the creator of the country’s wireless communications market. AWCC is also leading the Mobile Payment market by providing financial services to more than five million business and consumer clients located in all of Afghanistan’s thirty-four provinces. d.light is a global leader and pioneer in delivering affordable solar-powered solutions designed for the two billion people in the developing world without access to reliable energy. d.light provides distributed solar energy solutions for households and small businesses that are transforming the way people all over the world use and pay for energy. Through four hubs in Africa, China, South Asia and the United States, d.light has sold over 20 million solar light and power products in 65 countries, improving the lives of over 91 million people. d.light is dedicated to providing the most reliable, affordable and accessible solar lighting and power systems for the developing world and reaching 100 million people by 2020. Lighting Global and its affiliate program, Lighting Afghanistan, is the World Bank Group’s initiative to rapidly increase access to off-grid solar energy for the one billion people living without grid electricity world-wide. Lighting Global – managed by IFC and the World Bank, with support from the Energy Sector Management Assistant Program (ESMAP) – works with manufacturers, distributors, governments, and other development partners to build and grow the modern off-grid solar energy market. To date, more than 131 million people have benefited from using Lighting Global quality verified solar lighting products, and more than 39.5 million people have had their basic (Tier 1) lighting needs met. More than 26 million quality verified products have been sold since 2008, and in 2016 alone, more than 1.75 million tons of GHG has been avoided due to the use of quality verified products instead of kerosene.